Meanwhile, place Broccolini™ and 1/4 cup water in medium microwave-safe bowl. Cover; microwave on HIGH for 1 to 3 minutes or until thoroughly heated. Drain; set aside. Heat wok or large skillet over high heat until hot. 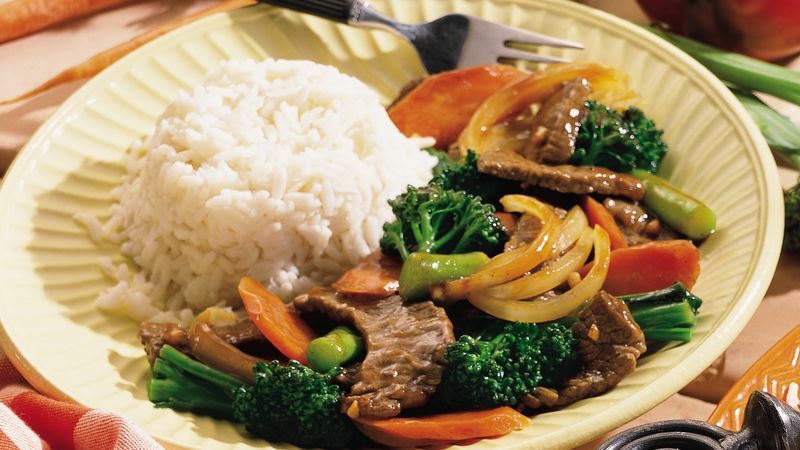 Add 1 tablespoon of the oil, beef and garlic; stir-fry 3 to 4 minutes or until beef is browned. Remove beef from skillet; place on plate. Add beef; stir-fry, uncovered, for an additional minute. Serve with rice. Broccolini™ is a hybrid vegetable, a cross between broccoli and Chinese kale. The tender stems as well as the florets are eaten, raw or cooked. Add raw Broccolini to salads or cook it just as you would cook broccoli. Slicing carrots on the diagonal yield big, attractive pieces that remain crisp in stir-fries. If you like spicy food, add one to two teaspoons of chile paste to the wok along with the stir-fry sauce. Chile paste or chile paste with garlic is available in the Asian foods section of the grocery store. Broccolini™ is a trademark of Mann Packing Co., Inc., Salinas, CA.